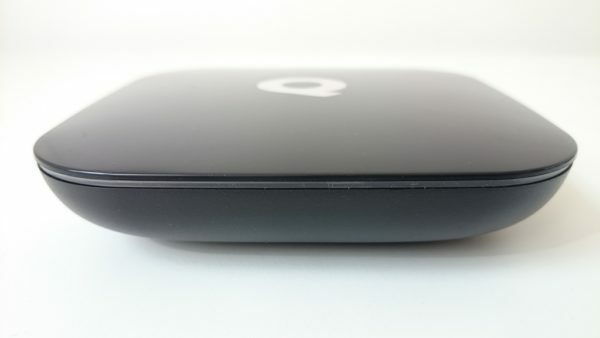 The Q-BOX TV Box is a visually different from the majority of TV Boxes, is less square. It has a nice design and a characteristic Q letter on top of the housing. The top cover is made of high quality glossy plastic. Also, the device has a tri-color backlight. Unfortunately, off TV Box / switches to standby mode do not turn off the backlight. Depending on your preferences, it might interfere when the room is dark. As we wrote at the beginning of his heart is a new Amlogic S905 Quad core 64-bit Cortex A53 Up to 2.0GHz processor which supports UHD [email protected] HW decoding, multiple formats including H.265 10-bit, H.264, AVS+ and also FHD 1080p @60fps HW encoding, H.264. On the front is a IR receiver and an around the TV Box is a LED backlight. On one side is a SD card slot. 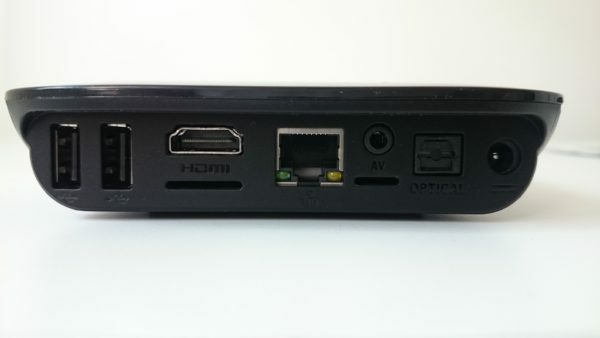 On the rear panelare: 2x USB 2.0 ports, HDMI 2.0 port, RJ45 Gigabit Ethernet port, AV port and 5V DC jack. 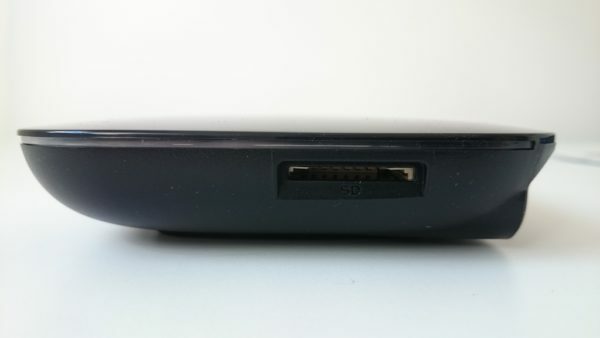 At the bottom of the device you will see a rubber base which prevents the device from slipping. Below also remote control. Booting Android to the “home screen” takes about 00:34.8 seconds. “Home screen” launcher Q-BOX looks the same as the T95, is simple, easy to use and familiar. In addition to theremote control I used a standard keyboard and mouse, MINIX A2 Lite and Xiaomi gamepad. Q-Box has also identical to the T95 pretty boot animation. 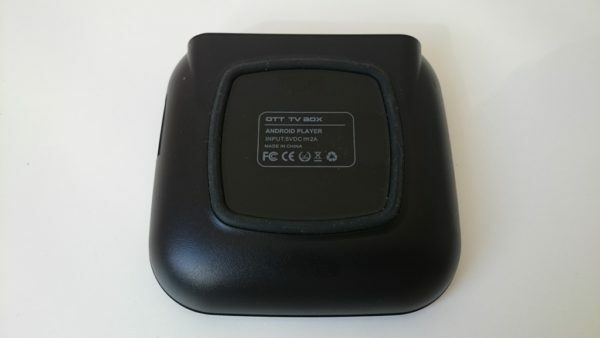 The TV Box can additionally be controlled using the application on the smartphone. 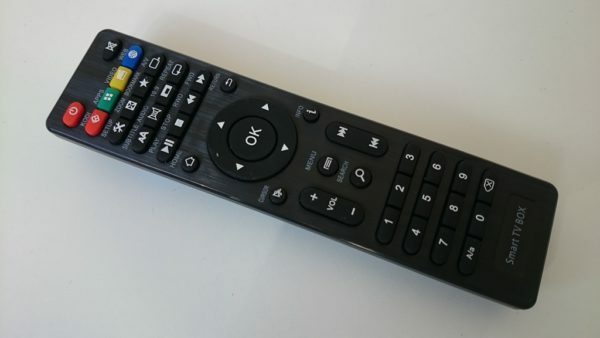 Download here – U1_remote.apk: http://bit.ly/1mlfUof. 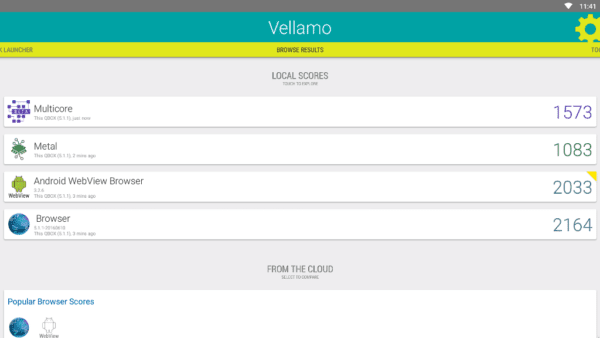 The application works with TV boxes based on SoC Amlogic: S905, S812 and S805. The device worked in the resolution of FHD 1920×1080 (1080p 60Hz) but you can also adjust the preferred resolution (also 4K) or set the auto mode. Launcher includes icons in different sized, enabling available for the most important functions, inter alia: Kodi, Apps, Music, Browser, Settings etc. 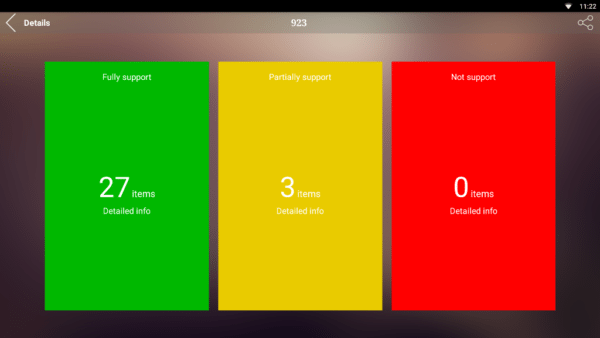 and also as at the top of the screen found a Dropbox and Clean Memory app. 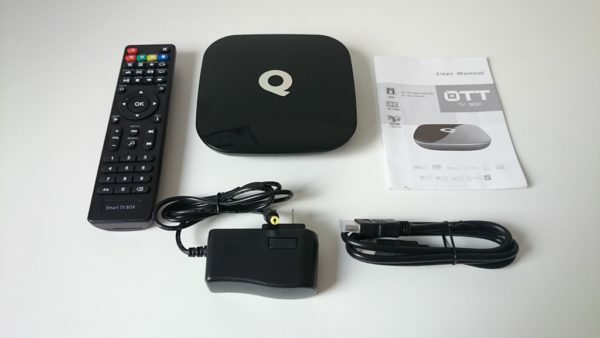 The Q-BOX TV Box has also DLNA, Miracast and Airplay. I had no problem with Ethernet and WiFi connection to my router and to Internet. 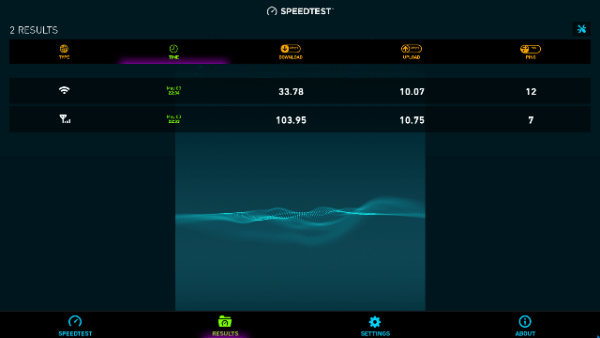 Below screenshot from SPEEDTEST. 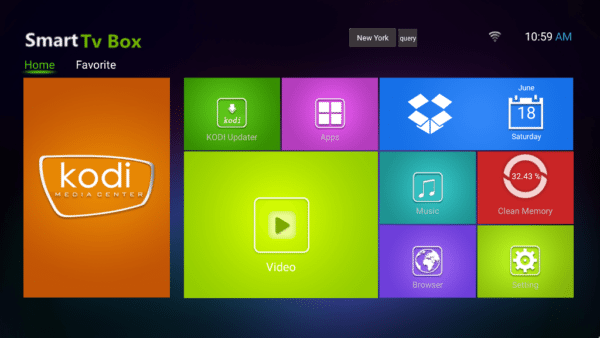 The Q-Box has a pre-installed kodi 16.0 Jarvis with a choice of add-TV Addons, or without. For the tests, we chose version with added TV Addons. Despite the problems (installed applications showed the problem: Your device is not compatible with this version) with an earlier firmware. It worked with the newer firmware (more about this later) to install a typical game with which most often are testing TV boxes. You can play without a problem just connect gamepad or air mouse and keyboard. I used Xiaomi gamepad (http://shrsl.com/?%7Eagb0). The combination of Q-BOX with Xiaomi gamepad is great fun. 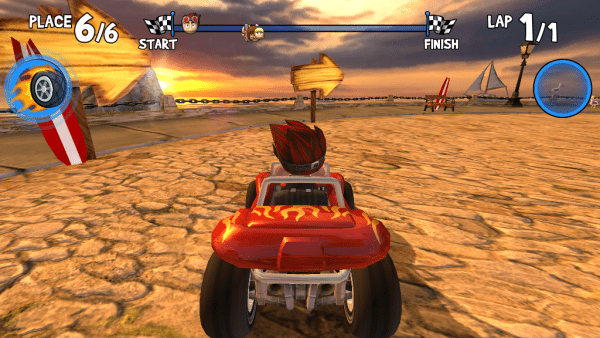 Beach Buggy Racing works without problem, even with high resolution works trouble free, also I was able to run Asphalt 8: Airborne which also worked without problems. 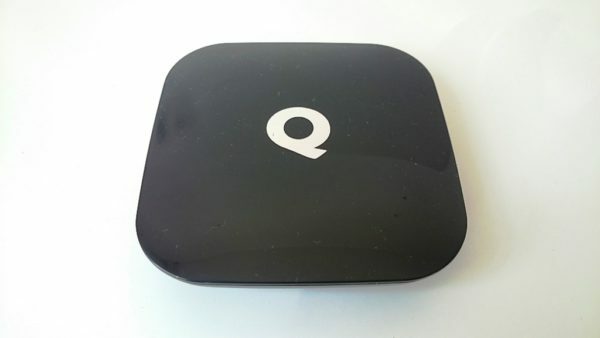 The Q-Box runs on the Android 5.1 Lollipop, namely version 5.1.1 and the Linux Kernel version 3.14.29. Unfortunately installed firmware (build number LMY47V.20151224 test-keys) on the unit we received had the incompatibility problem. Therefore we installed the latest firmware for Q-BOX – downloaded here (build number LMY47V.20160610 test-keys). TV Box is equipped in the recently very popular a SoC Amlogic S905 Quad core 64-bit Cortex A53 Up to 2.0GHz processor and GPU Mali-450, CPU speed between 100 MHz and 2.02 GHz. On the following screens you can see exactly the components used and their specification (Information taken from the CPU-Z app). 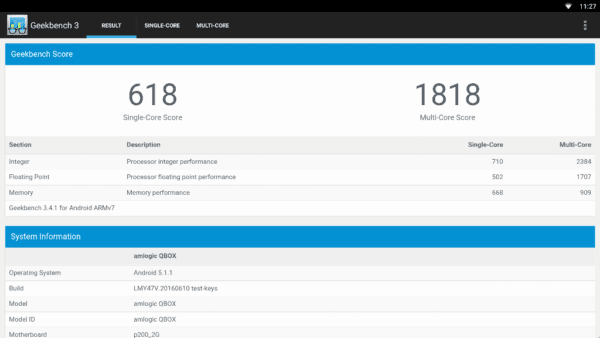 Unfortunately,Amlogic S905 is not yet recognized in the applications only detected ARM Cortex–A53. Also, the model device is detected as QBOX(p200-2G) and board p200-2G. After using the DRM info (app) we know that Q-BOX supports Google Widevine Moudlar DRM, but unfortunately does not support Microsoft Playready DRM and Verimatrix VCAS. For testing I use the AnTuTu Video Tester 3.0 app and AnTuTu Benchmark 6.1.4. The following screenshots from the video test. The result 923, slightly worse than HiMedia Q10 Pro (result 930), NEXBOX N9 (result 544), Z68 TV Box (result 442), MemoBox MX MAX (result 913), MXV+ (result 903), PROBOX2 Z (result 910), MX Plus (result 892). Other MRX (result 906), T95 (result 906), Minix Neo U1 (result 899), K1 Plus TV Box (result 886) and Beelink Mini MX (result 920). Also worthy of note is that Q-BOX TV Box did not have not supported codecs. Video playback by Kodi Jarvis 16.0 and MX Player runs smoothly and stable. 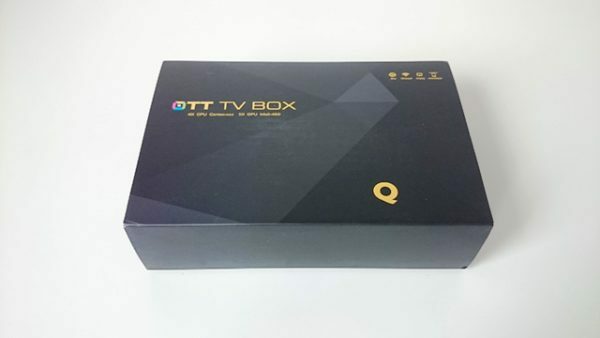 The Q-BOX TV Box without problem seems plays movies with the resolution of 480p, 720p and 1080p (24fps, 30fps,60fps) and also 4K (60fps) with various codecs video such as H.264, H.265, MPEG2, MPEG4, RMVB and audio – DTS and AC3. Dolby Digital 5.1 passthrough worked fine via HDMI. Also I tested several video formats – AVI, MKV, MP4 (typical formats in which it holds the majority of films) and also videos was played without any problems. The tested Q-BOX plays video files in 4K (also 60fps) without any major problems. The following table compares Kodi and MX Player for some video samples. Also copes well with playing the video on YouTube. The Q-BOX scored 36985 (HiMedia Q10 Pro – 38133, N9 – 21336, Z68 – 27053, MX MAX – 35024, MXV+ – 34208, PROBOX2 Z – 35996, MX Plus – 35808, MRX– 35466, Sunvell T95 – 28731, MINIX Neo U1 – 37564, Beelink Mini MX –34123, K1 Plus – 29252, PROBOX2 EX+ – 34332, ZIDOO X6 Pro – 30158) on AnTuTu Benchmark v6.1.4. 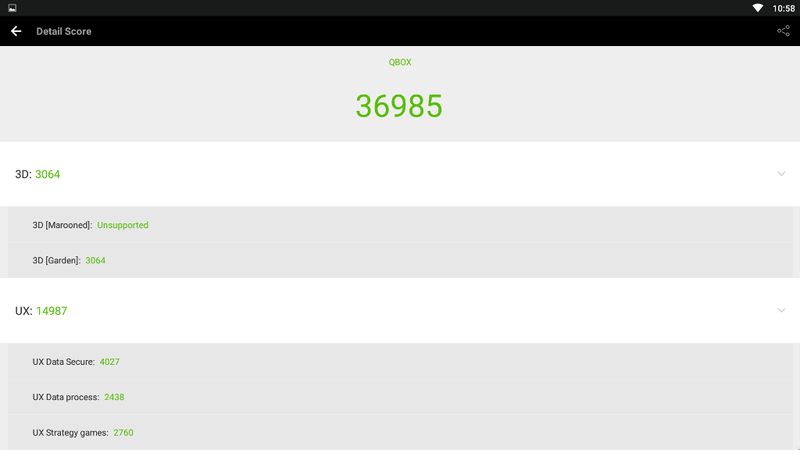 The Q-BOX on GeekBech 3 scored: Single Core score – 618 and Multi Core score – 1818. Below some of screenshots. The Sunvell Q-BOX scored 4335 (NEXBOX N9 – 2203, Z68 – 3319, MX Max – 4349, MXV+ – 4218, PROBOX 2 Z – 4333, MX Plus– 4300, MRX – 4357, Sunvell T95 – 4300, MINIX Neo U1 – 4326, Beelink Mini MX – 4282, K1 PLUS – 4299, PROBOX2 EX+ – 5834, ZIDOO X6 Pro – 4431) on Ice Storm Extreme. Ice Storm Unlimited scored 7361. Below screen with the results in Vellamo. Q-BOX TV Box has the internal memory benchmarks: Read 13.08MB/s – Write 27.54MB/s. RAM copy speed was 1189.03MB/s. 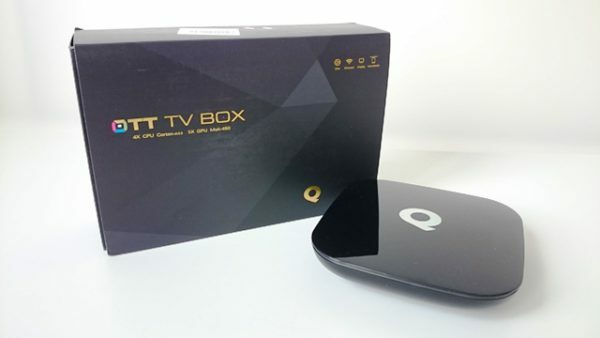 The Sunvell Q-BOX TV Box has a nice design and a characteristic Q letter on top of the housing, is well and solidly made TV Box. TV Box is equipped in the recently very popular a SoC Amlogic S905 Quad core 64-bit Cortex A53 Up to 2.0GHz processor. Plays typical video content in 1080p and copes well with the video in 4K (also with 60fps). The Q-BOX has nice and an easy to use UI which provides quick and intuitive access to key features. The Sunvell Q-BOX also has good value for the price ($51.99 + free shipping). Once again I want to say thanks to Gearbest for sending us a Sunvell Q-BOX review sample. 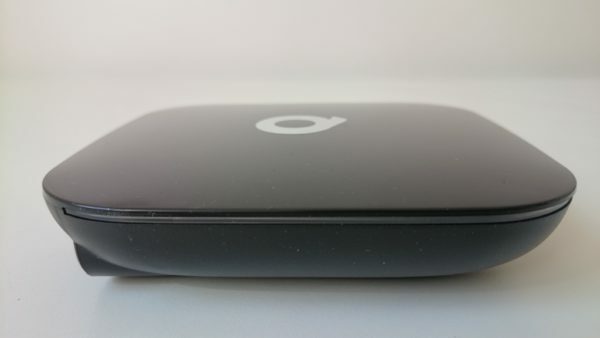 If you are looking a TV Box with Amlogic S905 chip, which copes well with play most video files and 4K and do not want to undermine its own budget – Sunvell Q-BOX is for you. I live round the way from the post office... but geekness makes me want to use this.